Yes a week since the last blog post. To be honest, not much has happened here. Each morning I read the narrowboat blogs we follow and reminisce about our life on Waiouru. Then I give myself a jolt of reality by reminding myself about all those hours I spend on board researching everything else I planned to do when we move on to the next phase of my life. The mind seems quite capable of remembering the good times whilst conveniently forgetting those other times. Our alterations to the house have become very fluid. Initially we were going to extend the front of the house to make a new master bedroom with en-suite. That started to look quite expensive which led us to consider extending the existing master bedroom by constructing an en-suite at the front of the house. Then we reverted back to Plan A only to discover the spear for the bore was in the middle of our proposed bedroom. Several thousand dollars would be required to relocate it. Finally we had a good discussion about our essential and desirable criteria. The essential thing proved to be a second lavatory. Consequentially we have decided to minimize our expenditure by removing the existing bath and replace it with a second toilet. Neither of use have had a bath in 30 years (well we are smelly ex boaters).....<Ok Ok> We shower rather than bathe! That got us thinking about the existing shower. If we removed all the existing ceramic tiles in the cubicle it would be possible to line the shower with coloured glass using the same method employed in the kitchen. That would mean there was no grout making it easier to clean the shower. Of course all of this planning meant we needed to re-think the layout of the existing master bedroom. We've decided to rip out the existing wardrobe replacing it with something new. The swinging wardrobe timber doors will be replaced with sliding door. We also need a new power socket and TV antenna connection. 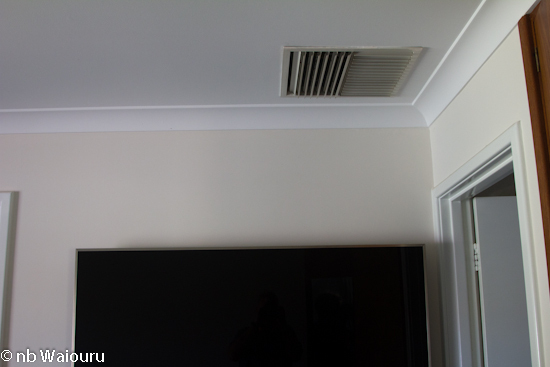 There is an existing power socket in the lounge room which I could connect to a new power socket in the bedroom. 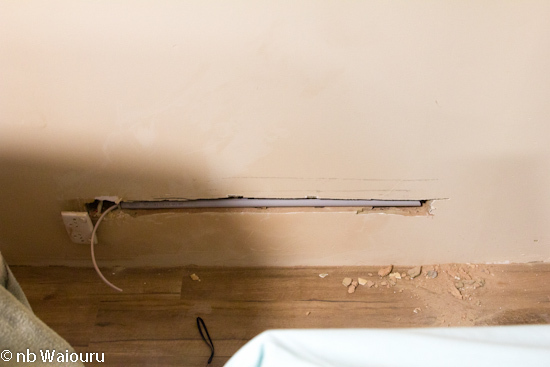 I needed to cut an 800mm long channel in the brick wall and then drill a hole through the wall to the bedroom. There's probably a proper tool for cutting through brickwork but I used the angle grinder and a cold chisel. 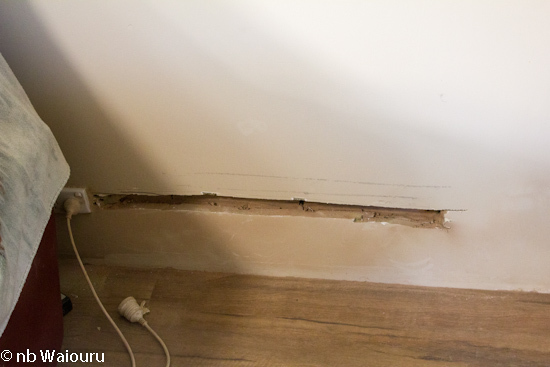 I marked out the size of the 'chocolate box' on the bedroom wall and then drilled a series of holes around the perimeter before using the cold chisel and hammer to make a suitable sized cavity. Then the process of plastering the channels and holes could commence. 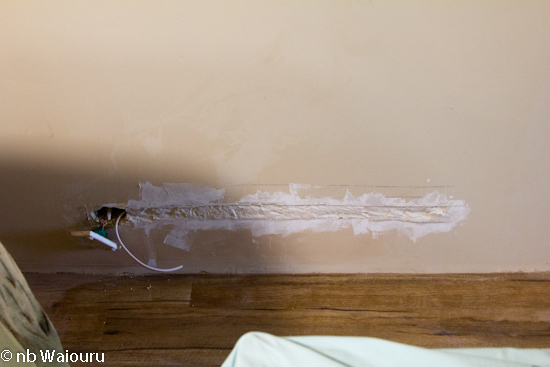 I'm going to have to repeat this process several times before sanding the wall flush and repainting it. Meanwhile the next stage is begging to be done. The old ducted evaporative air conditioning system is going to be removed. 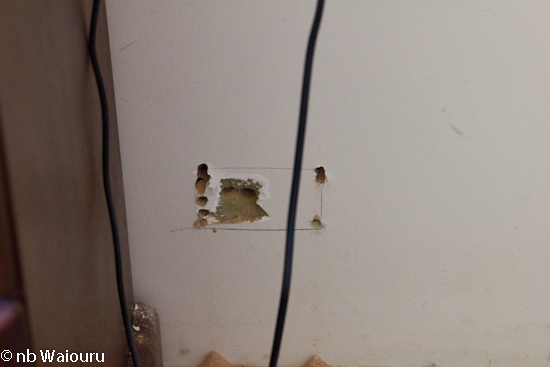 The first outlet to be removed is the one in the master bedroom. 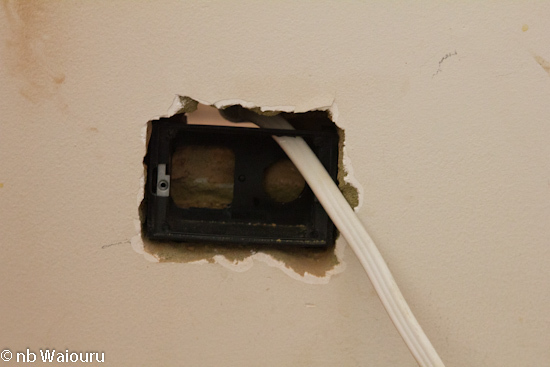 I've selected this one because it's removal will allow me to see how easy (or hard) it will be to drop the TV antenna cable down the wall adjacent to the outlet vent. The vent will be plastered over. I've also been busy in the front garden. The Pepper Gum Tree was removed last year and I was in the process of levelling the site when I discovered a maze of pvc reticulation pipes. The bore spear is at B directly in front of the lounge windows. 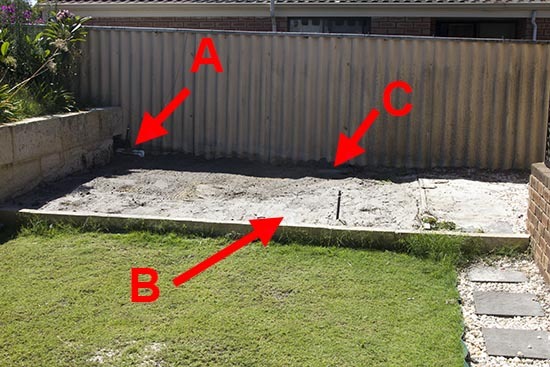 It was probably located here because the Pepper Gum Tree prevented the installer locating it closer to the fence. There is a pipe junction box at C which was also buried. You can also see some exposed pvc reticulation pipes at A. When I levelled the land the reticulation pipes (three of them) were exposed between C and A. I had to modify all the pipework to bury them. The surplus soil was barrowed to the top front lawn and spread out filling in the bumps and hollows. Jan is thinking of planting two of her citrus trees on the newly levelled patch. A third tree may go in the middle of the grassed area in the above photo. I haven't forgotten the problem of Open Live Writer and photos. There doesn't appear to be a solution at this time. One final comment. The electrical inspector arrived yesterday to check on the recently installed earth spike. He was originally from Aberdeen, Scotland, emigrating to Perth many years ago. Despite this, he had a very thick accent. So thick I could scarcely understand him. I almost laughed when he told Jan he'd lost his accent. He went on to tell Jan he'd phoned his father back in Aberdeen the previous week to wish him a happy birthday. Apparently his father didn't recognise his voice and asked "Who is this?" When Ken (the inspector) told him it was his son, his father replied "Why are you speaking so posh?"